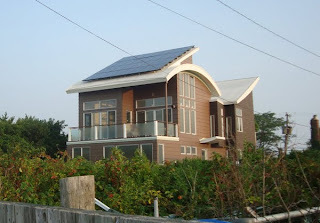 Just over a year ago I wrote this post about a sustainable beach house in the process of being constructed on Long Island's beautiful south shore. With the catastrophic oil spill in the Gulf of Mexico on everybody's mind right now it seemed the most appropriate time to re-visit the project and ask what measures we can take - and by "we" I mean residents, homeowners, architects and designers - to reduce our dependence on fossil fuels while continuing to enjoy abundant heat, light and electricity. Built by Bouler Architecture, the house at Oak Beach received the highest energy rating on Long Island. 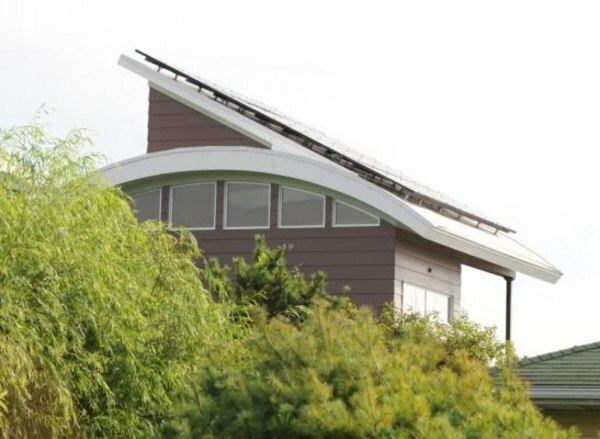 With its geothermal system, photovoltaic solar panels, white EPDM roofing material and use of passive solar techniques - basically careful placement of windows and roof-lines to shade the sun in summer and heat it in winter - it has been performing at a far more efficient level than predicted. Even in the short, sunless winter days the house was producing electricity. For the moment these "green" technologies incur a greater initial cost than power derived from carbon but they have irrefutable and overriding benefits. Using renewable energy sources, wind or solar, means less pollution of the air and water, and as we have experienced since April, when a disaster occurs in the extraction of oil or gas, the cost to wildlife and the local economy can be devastating. For more on this sustainable project click on over to Bouler Design's blog where I guest-blogged today. What a wonderful job you did on guest blogging for us! James was thrilled with your entry and your insight. And a very powerful piece you've written here.